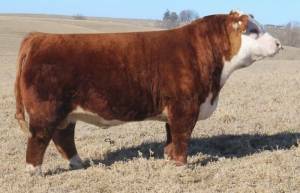 Here is the "Home-Run" sire from KLD and Bear Grove Beef. Sanders Ranch first found Ben in the "make up" area in Denver in 2016 and absolutely fell in Love with him!! Sanders flushed cows to him and got his first calves in early Jan 2017. Loved the calves! They went back to Denver in 2017 and fell in love with Ben all over again! Ben uniquely combines overwhelming depth and power without sacrificing any athletic ability! Ben comes from a very potent cow family that is known for producing breed leaders. All the signs point for Ben to be the next great dominating Mini Hereford sire! His very first calf to hit the ground was Calf Champion at Jr Nationals and Reserve Calf Champion at both KC & NAILE!